Scott D. Feringa is a seasoned trial attorney with more than 33 years of litigation experience. He advises and counsels numerous hospital systems and healthcare providers in Michigan, and serves as national trial counsel for several of the most recognizable brands of manufactured, distributed and retail goods in the United States. 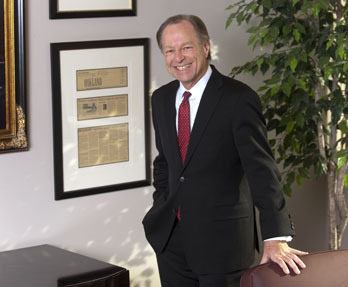 Scott formerly served as a member of the firm's executive committee and board of directors. Scott’s practice focuses primarily on healthcare defense, sophisticated products liability, and gas and electric public utility accident litigation. In his healthcare practice, Scott represents hospital systems, physicians, dentists and other healthcare professionals in medical malpractice actions, and foreign and domestic manufacturers in sophisticated products liability actions, including national medical products liability claims. He also handles fire and explosion litigation for utility companies and product manufacturers nationwide, as well as represents ski and golf resorts in personal injury litigation. Scott is a frequent and popular speaker at national and regional symposia related to healthcare law, products liability and ski area litigation. He has been elevated to membership in the American Board of Trial Advocates, and is among a small percentage of attorneys from across the country elected by his peers for inclusion in Best Lawyers in America® in the fields of medical malpractice and product liability litigation. Every year since 2006, Scott has been awarded the ranking of Michigan “Super Lawyer,” by Thomson Reuters. Scott also has been awarded and maintains the Martindale AV rating which is the highest rating available. In 2013, he was selected as a “Top Rated Lawyer in Healthcare Law” by American Lawyer Media and Martindale-Hubbell. Scott and his team were involved in the series of cases and claims arising out of the Wayne, Michigan and Royal Oak gas pipeline incidents on behalf of a Michigan Public Utility. Many of these were resolved without litigation, without publicity, and with minimum costs to the client.